Springfield College junior fullback Jordan Wilcox had a career day last Saturday, rumbling for a career-high 174 yards and four touchdowns on 12 carries in his team’s 70-47 win over Rochester. “Our offense can do a lot of great things when everyone does their job,” Wilcox said a few days after his team’s Homecoming victory. Wilcox rushed for a trio of first half scores, including a pair in the second quarter, before ripping off his longest rush of the afternoon – a 54-yard touchdown in the third quarter, which helped the Pride push ahead for good. Two days after his team earned their fourth win of the season; the Liberty League honored Wilcox by naming him the Offensive Player of the Week. The Eastern College Athletic Conference (ECAC) also honored Wilcox, naming him this week’s Division III North Offensive Player of the Week, too. Noontime Sports caught up with Wilcox following his team’s exciting win to discuss his performance, as well as what Springfield must do to secure a win this week against Hobart. How did your o-line (and teammates) help you enjoy an extremely successful day on the ground with 174 yards and four touchdowns? Those guys upfront do a great job coming off the ball and really opening up huge running lanes. Our halfbacks took on (some strong) linebackers at the second level to get me into open field, so I give a lot of credit to them. Have you ever scored four touchdowns in a game before – say in high school (or perhaps a pick-up game)? This was the first time I have scored four touchdowns in a single-game since peewee football. I scored three touchdowns in a game in high school. All in all, (my four touchdowns from last Saturday) would not have happened if it were not for the other 10 guys on the field doing their job. Tell me how you have been able to improve every week – gaining either similar yardage from the previous week or more? Every week I go into film sessions and practices trying to correct the little things so the big things can happen on Saturdays. (My goal is) to put our team in the best possible position to win every play, so we can win every game. Tell me about the WPI game. How did your team overcome a three-score deficit to defeat the Engineers for an important Liberty League victory? WPI was a big game for us. Things weren’t going as expected during our team’s first few drives, so our defense really kept us in the game with a few turnovers. (First-year) quarterback Chad Shade came into the game (following a few offensive series) and we – the offense – rallied behind him to secure an important conference win. Would it be fair to say the WPI game provided your team with a boost of confidence heading into St. Lawrence and other Liberty League games thus far? It did. We knew what we were capable of doing as an entire team against a good opponent like WPI, but the biggest takeaway was how our team executed (against the Engineers). This week, your team faces Hobart on the road – what’s the biggest goal and objective your team must accomplish in order to secure a road win? It starts with a good week of practice, while also watching film and focusing on what we need to do to be successful. Do you idolize your game after a current or past fullback (or running back)? If so, who? Growing up, I idolized running backs like Adrian Peterson. Your three favorite movies are? Friday Night Lights, We Are Marshall and Remember the Titans. Who is your all-time favorite band or musician? Favorite football memory of all-time -could be here at Springfield or while in high school? The last book you read for pleasure? Our preseason college football coverage commenced on Monday with a trip to WPI to meet with the Engineers. We chatted with a variety of players – you’ll be seeing those video interviews soon – but also head coach Chris Robertson, who is very excited about his fourth season on the sidelines. Noontime Sports: This season, your team features all your recruits from seniors to freshmen. That must be exciting, right? NS: It certainly seems like there’s a different vibe surrounding this team because everyone is rather excited about practicing, as well as working hard off the field. NS: I am guessing these traditions; along with your team’s senior leadership is what’s helping everyone come together, right? NS: Let’s quickly chat about your team’s schedule. Similar to last year, you’ll face the same non-conference foes (Curry College, Norwich University and Worcester State). Care to share why you scheduled these games again? NS: Finally, your team starts its season under “Friday Night Lights” against Curry. That has to be an exciting feeling, even from a coach’s perspective, right? One more game… that’s right, one more game and then the light’s go out. Friday Night Light’s season five finale is this Friday, (July 15, 2011) and yes, it’s a bittersweet feeling. This particular series wasn’t just about the sport of football, but instead, a family, community and school, as well as the state of Texas. Each character represented one of us, as well as encountered the same troubles we all dealt with on a daily basis such as love, trust, focus, family, work and school. Yet, why did we become so attached? 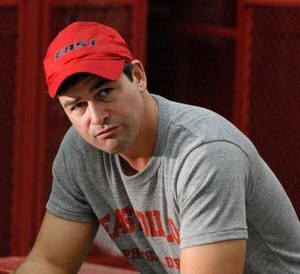 What exactly persuaded us to listen to Coach Eric Taylor’s pre-game speeches in the West Dillion locker room? Why did we always side with Tami Taylor? Also, what forced us to cheer for the truest underdog of them all, Matt Saracen? Well, it’s because we were indeed apart of this “fantasy world.” We were fans in the stands every Friday evening, students in the hallway and members of the community who voted at town meetings. Seriously, we cared so much about this particular “small” Texas town and now, it’s coming to end, (bummer). It’s hard to imagine life without Friday Night Lights, but seriously, I’m sure many of us won’t forget this amazing series. There were so many wonderful memories, dramatic moments, but also, significant events that made this particular show so enthralling. Although, as Coach Taylor’s daughter, Julie Taylor once said, there’s no place in the world like Dillon, Texas. Friday evening can’t come soon enough, yet, once the lights officially go down, we too will walk away from our televisions, computers or mobile devices knowing that just like so many characters, it’s time to move onto greener pastures. It’s been an exciting ride, however, before the cast and crew take their final bow, we’ll get to watch Coach Taylor attempt to win yet another Texas State Championship, so save your voices because I’m sure we’re in for yet another epic showdown. All in all, it’s safe to say, we’ll always be apart of the imaginary world of Dillon, Texas.